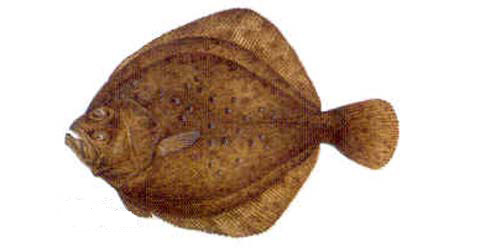 This flatfish is found in the Atlantic Ocean, the Mediterranean Sea and the south-west of the Pacific Ocean. It can attain a length of 100cm, and lives at a depth of 20 to 70 metres. It is a fish of prey that feeds on smaller marine animals. Turbot is chiefly used combined with other sorts of fish or vegetables. Thus there are recipes for turbot with scampi, patties with turbot and spinach or green pepper. Grilled with herbs and garlic butter, turbot is a delicacy this way too.